BY MALIA ZIMMERMAN – Hold on to your wallet. 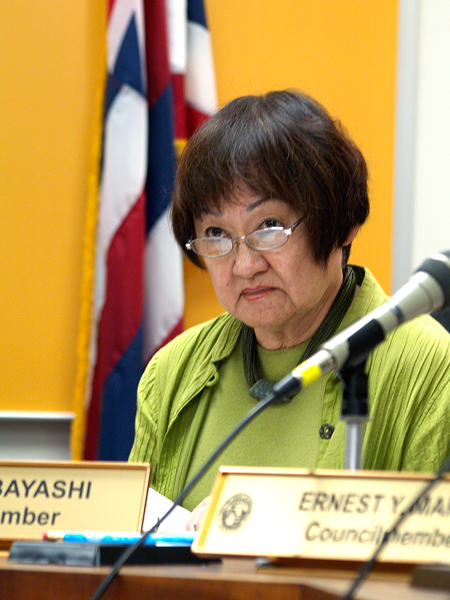 That was the advice from Honolulu City Council Budget Chair Ann Kobayashi after she was asked about the 9.65 percent annual water use rate increase authorized by the Board of Water Supply yesterday, which totals about 70 percent over the next 5 years. The Board said it needs the revenue to make vital upgrades to island infrastructure. The island of Oahu, where an estimated 900,000 people or the vast majority of Hawaii’s population live, had 364 water main breaks per year between 2005 and 2009 – or an average of one break per day, and that trend continues today. But Kobayashi is concerned that Oahu residents will be hit hard in the coming years, not only by this water rate increase, but by many other tax and fee increases that are now going into effect islandwide. Kobayashi suggests the semi autonomous agency should be looking for ways to bring in additional revenue – such as leasing out its office buildings or making better use of its extensive land inventory – rather than raising fees at a time when the public can least afford it. In addition to water rate hikes, the public has been hit with tremendous increases in sewer bills, also for the purpose of infrastructure upgrades. About 7 years ago, the Honolulu City Council and mayor increased the cost of sewer fees by 25 percent, and since it has increased between 5 and 10 percent for every year that followed, Kobayashi said. Those fee increases over the last several years were accompanied by a substantial rise in car registration fees on the county and state levels as well as property taxes hikes for both residential and businesses land owners. The 9-member Honolulu City Council passed an ordinance to help alleviate some of the property tax burden for residents with fixed incomes, including senior citizens, and Kobayashi may introduce another proposal that would do the same for their sewage bills. But that may not be enough relief for most residents suffering financially in toughest economic times. Hawaii already has among the highest overall tax burdens and cost of living in the nation. And the costs keep piling up. Besides taxes and user fees imposed by the county and state governments, Matson Shipping, which brings two-thirds of all cargo container shipped goods into the state, is increasing its charge by 5 percent, and this will boost the cost of most goods coming into the state, Kobayashi said. “How are people going to make it? I just don’t know,” Kobayashi said. But the rising expenses won’t stop the city administration from its spending spree. Yesterday, the Honolulu Rapid Transit Authority board announced its members approved a $1.4 billion, 14-year contract with the Italian based Ansaldo that includes providing rail cars and a control system, and operating and maintaining the rail. The entire project is slated to cost $5.3 billion, with $1.5 billion promised by U.S. Senator Daniel Inouye, Hawaii’s senior senator, who also serves as Chairman of the Senate Appropriations Committee. The rest of the construction and operation and maintenance costs will come from local taxpayers. Panos Prevedouros, a professor of civil engineering at the University of Hawaii, who performs transportation studies for various governments around the world, is opposed to the rail project because he said it won’t alleviate traffic and it is too expensive and inflexible. The billions of dollars that will be slated for the rail should be spent on Oahu’s estimated $5 billion needed in infrastructure repairs and other less costly transportation alternatives that will actually improve traffic flow, Prevedouros said. But the city has put the project on a fast track. The only thing that may derail the rail at this point is a lawsuit pending in federal court that challenges whether the city and federal government considered other less costly and more environmentally friendly alternatives before approving the Environmental Impact Statement for the 20-mile elevated steel on steel rail system. The plaintiffs include several high profile community and government leaders including Honolulutraffic.com founder Cliff Slater, former Gov. Benjamin J. Cayetano, the Small Business Hawaii Entrepreneurial Education Foundation, Retired Judge and former City Council Chair Walter Heen, Dr. Michael Uechi, Hawaii’s Thousand Friends, and University of Hawaii Law Professor Randal Roth. The city aims to throw some of the plaintiffs off the case, saying they don’t have standing. That will take place in federal court on Wednesday at 10 a.m.
At least the discussion regarding real property tax exemptions has started. We are currently subsidizing credit unions, social clubs, labor unions and other non-charitable organizations to the tune of millions of dollars every year. These are the easiest exemptions to remove and should be regardless of the pending increases in fees. When citizens are enjoying a healthy and free life in completely safe environment then it is called the country is economically developed. Taxation is an important factor for economic development of a country. The more advanced the country is, the more likely its citizens are to purchase the cars. But more taxes from customers should be avoided.